Look at all of those lovely bits of scrap!! !<br> <br> Crushed Velvet, Cotton, Lace, Cobweb Lace, Satin, PVC... perfect for all manner of crafty projects!<br> <br> Unfortunately, we have had to throw all these pretty things away in the past.. which isn't exactly good for the environment. So we thought, why not just charge for postage, packing and admin fees, and see if someone else can put them to good use?<br> <br> We'll send you just under 2.00kg of scrap, in as wide an assortment of fabrics and shades as possible - obviously we can't guarantee exactly what will be in the bag, as the scrap will vary due to what else we're making that week - but if you have an specific requirements, please don't hesitate to ask. Look at all of those lovely bits of scrap!!! 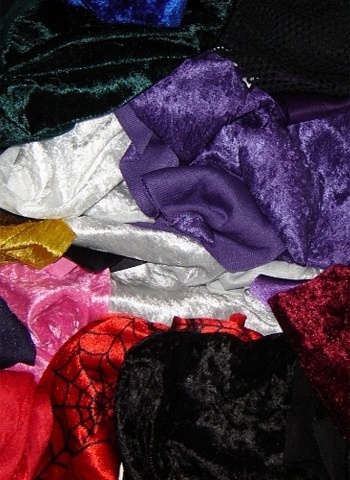 Crushed Velvet, Cotton, Lace, Cobweb Lace, Satin, PVC... perfect for all manner of crafty projects! Unfortunately, we have had to throw all these pretty things away in the past.. which isn't exactly good for the environment. So we thought, why not just charge for postage, packing and admin fees, and see if someone else can put them to good use? We'll send you just under 2.00kg of scrap, in as wide an assortment of fabrics and shades as possible - obviously we can't guarantee exactly what will be in the bag, as the scrap will vary due to what else we're making that week - but if you have an specific requirements, please don't hesitate to ask.